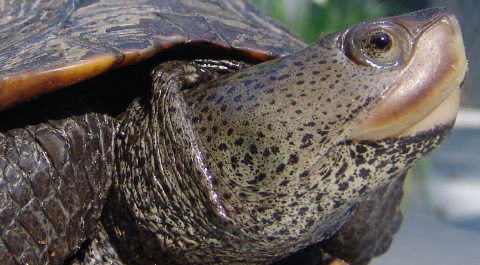 Once in a blue moon comes a turtle, a diamondback terrapin, that provides researchers with such rich material that we describe the event as a home run. Such a turtle, Terrapin #272, scrambled ashore at a newly discovered nesting site, Holly Beach, on the west coast of Sippican’s Outer Harbor. This exquisite female had first been discovered by Turtle Journal in June 2005 at another nesting site. Today she revealed how well she has done in the intervening seven years. She hinted that deteriorating conditions at her former nesting beach had pushed her to a new location. She gave us 12 fresh and viable eggs to study and to protect. And with a little bit of good fortune, her nesting efforts will yield a clutch of perfect hatchlings in September to examine and to release as new recruits to restore the dwindling population of Sippican terrapins. Don Lewis strolled down the lane at 1 pm to check the newly discovered nesting spot at Holly Beach. 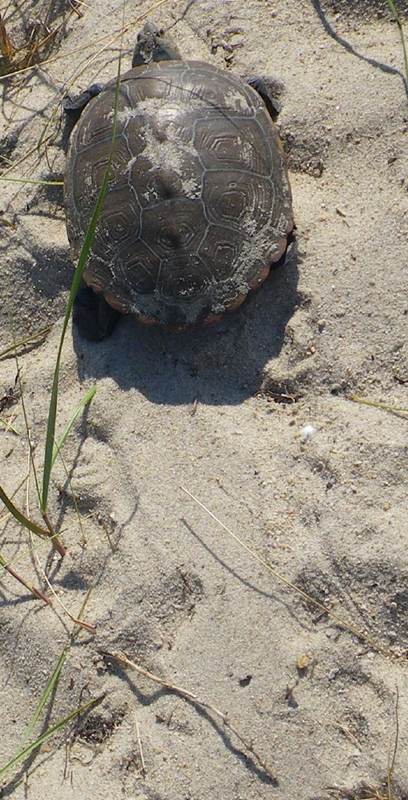 So far this season, after being alerted to the site by concerned residents, Turtle Journal had confirmed more than a dozen depredated nests and had examined three female terrapins at Holly Beach. 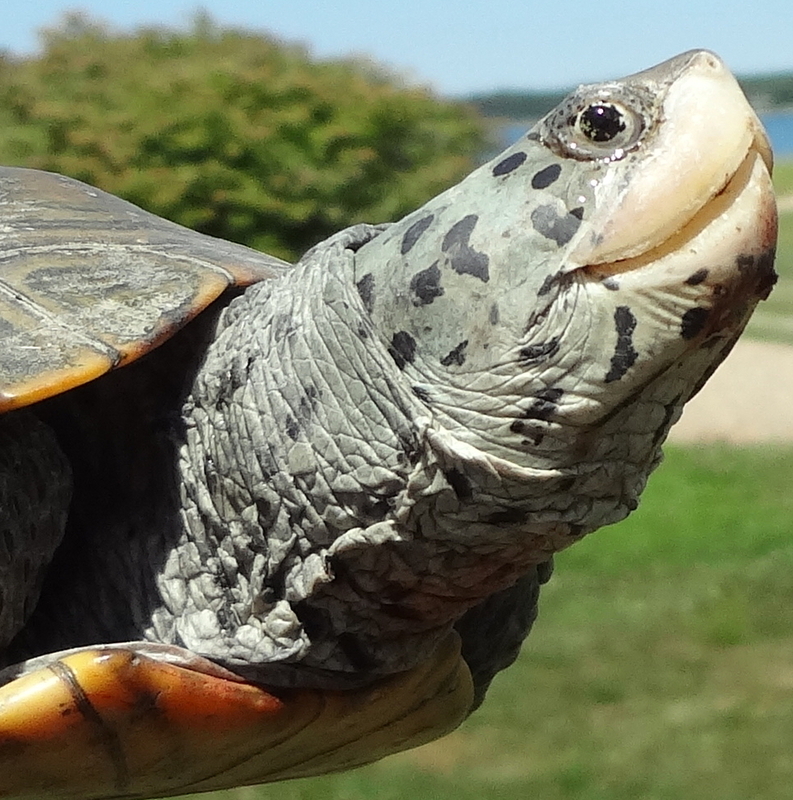 See Tracking Elusive Terrapin Yields Important Discovery: Legendary “Bigfoot” of Buzzards Bay and Rescued Terrapin Thrives in New Habitat: “Bumpy” Stretch Behind Her. 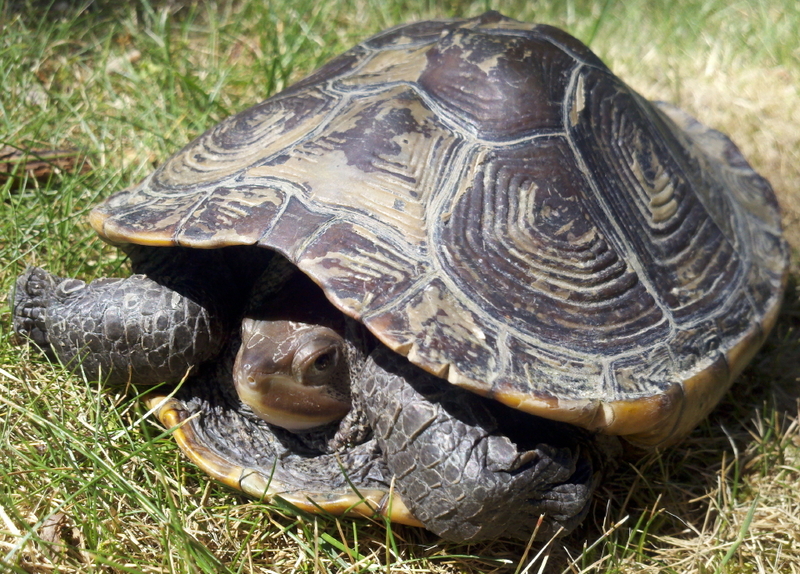 As Don approached the beach, he spied a turtle crawling swiftly through the grass. He dropped behind a boulder and a stand of phragmites to avoid disturbing her. The terrapin stopped here and there along her journey, she scratched the surface and threw dirt over her shell, and she went on. At one spot, she thrust her face into the soil, paused for a moment, then moved her powerful back legs over the sand, and began digging in earnest. Alternating left and right rear limbs, she probed deeply into the ground. After 15 minutes, she paused again, positioned herself over the hole, and began the laying cycle; deep breathing, dropping eggs and positioning them carefully in the egg chamber. Once the terrapin began to cover the nest, Don moved closer to film the final moments and to be sure he could find the now camouflaged nest. We first saw Terrapin #272 on 22 June 2005 on a nesting run at the barrier beach in Aucoot Cove. She was still gravid (carrying eggs) and weighed 990 grams. On July 17th of the same year, we saw her again on a nesting run for her second clutch of the year. She was gravid and weighed 913 grams. That weight loss is expected from first to second clutch, since a terrapin invests 10% to 15% of her body mass in each set of eggs. 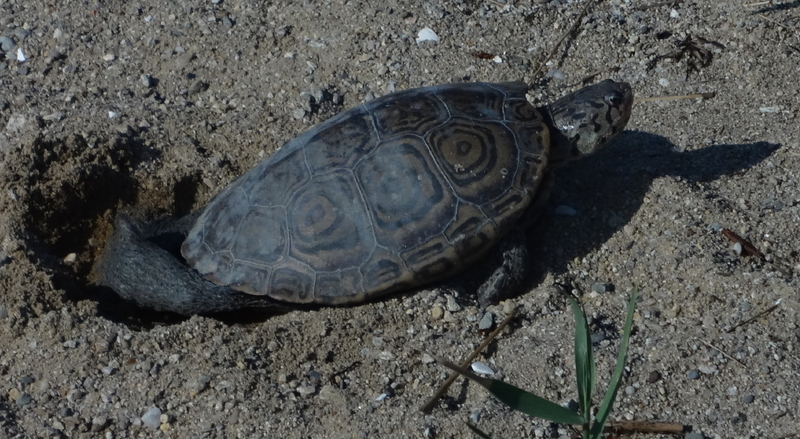 Today, Terrapin #272 was nesting at Holly Beach, which is in the next estuary to Aucoot Cove. The turtle would have had to swim about a mile around Converse Point or crossed about a quarter mile on land to reach her new nesting site. 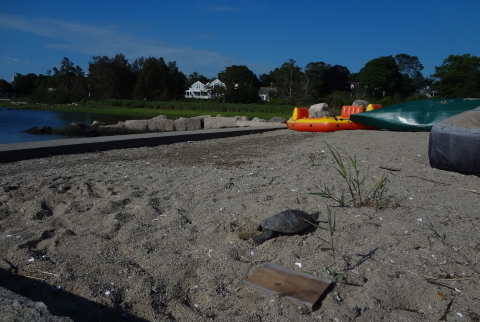 Turtle Journal has long noted that nesting conditions on the Aucoot barrier beach were deteriorating due to increased human activity and continuous storm washover. We had speculated that turtles would be forced to find new nesting areas before long. Terrapin #272 is the first turtle that we have confirmed taking this predicted course of action. 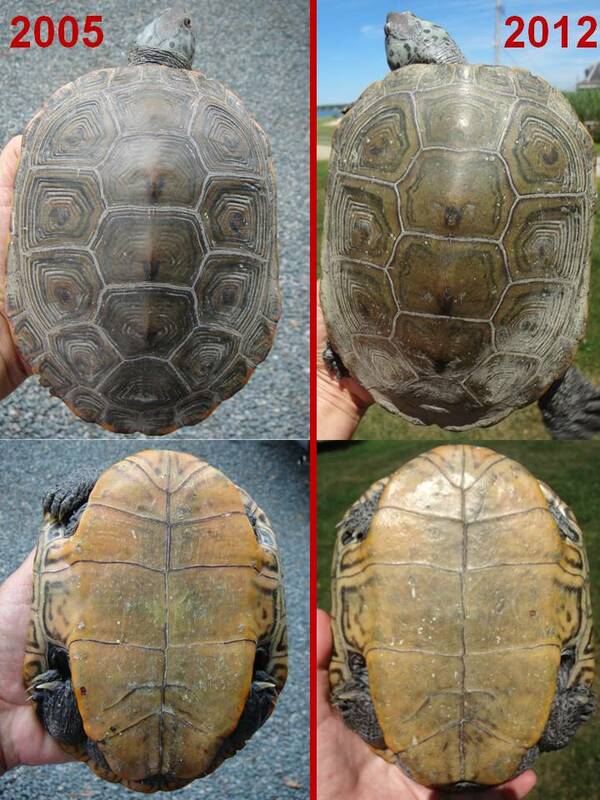 In the intervening seven years, Terrapin #272 has grown almost a full centimeter in length. 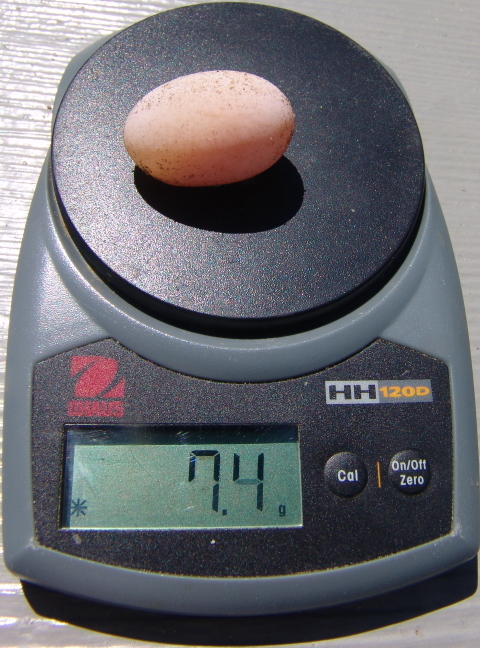 Her new weight, including the egg mass she had just deposited, was close to 1100 grams. After securing the turtle, Don and interested residents, examined the location that Terrapiin #272 had chosen to dig her nest. It was a grassy spot that would prove challenging for the eggs to avoid root and other predation. Since these eggs represent the first viable nest discovered at the new site, Don decided to relocate them to a secure turtle garden where they could incubate in safety Once hatchlings emerge in September, they will be returned to the nursery salt marsh abutting Holly Beach. 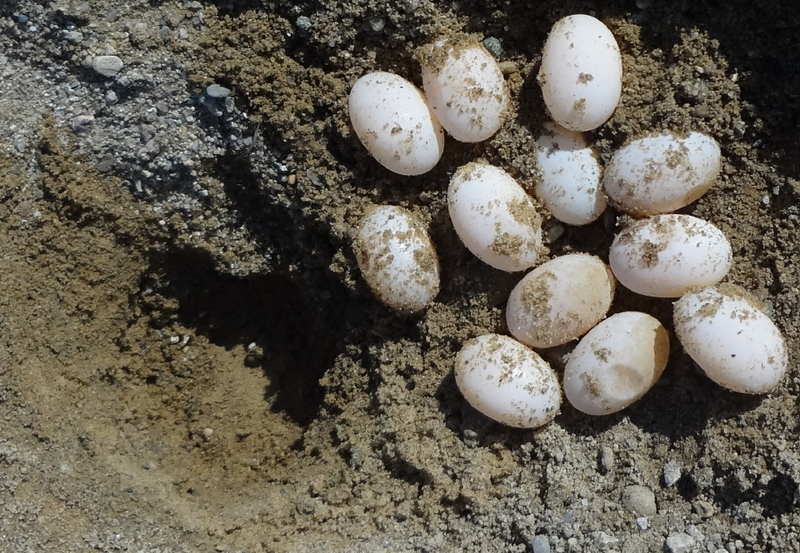 Resident Lisa Novakoff, whose home overlooks the nesting site, holds the 12 pink and perfect eggs deposited by Terrapin #272 at Holly Beach. Andretti, a young and inquisitive visitor, watches in amazement. An element of our research home run is to have access to the eggs of a known female (#272). 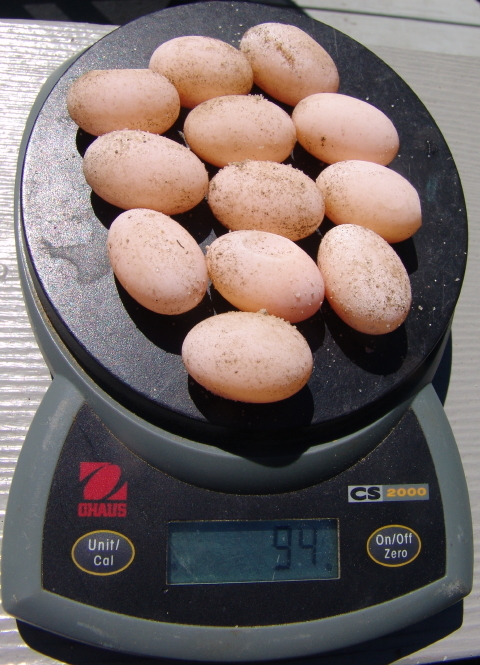 We weighed the eggs to determine the overall clutch size (94 grams) to compare to the mother’s size. There would have been a few additional grams of “water” to add to the egg mass. 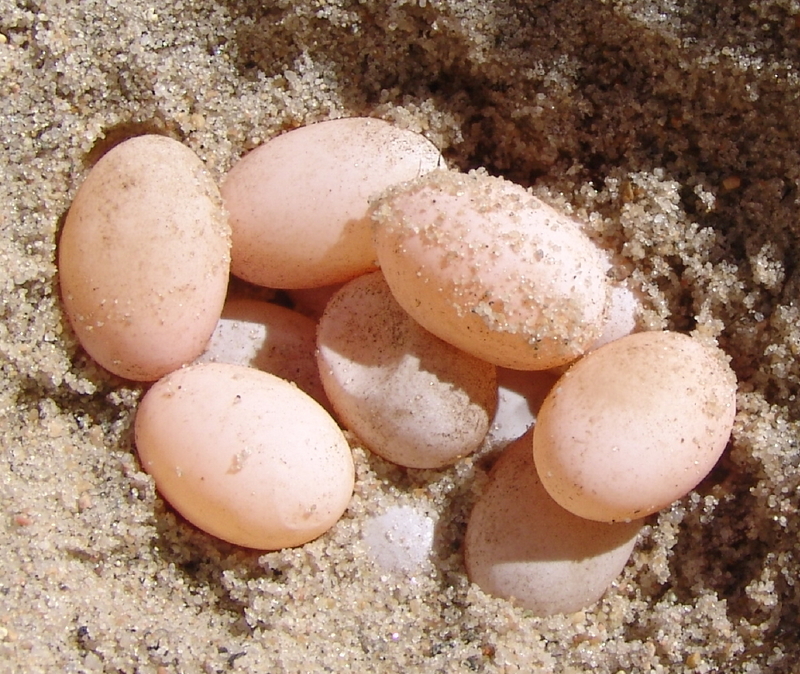 Second clutch nests tend to be lighter than the first clutch, because mothers have already invested a large percentage of their body mass in their first set of egg. There also tends to be one or two fewer eggs in the second clutch. Since the nest was being relocated to a safe turtle garden, we had the opportunity to take measurements of each of the eggs. Later, we will compare these measurements to the eggs just prior to “pipping,” when the babies pierce the eggshell, and with the hatchlings once they emerge. The eggs ranged from 7.4 grams to 8.6 grams, and from 2.92 to 3.30 centimeters long, and from 1.94 to 2.03 centimeters in diameter. 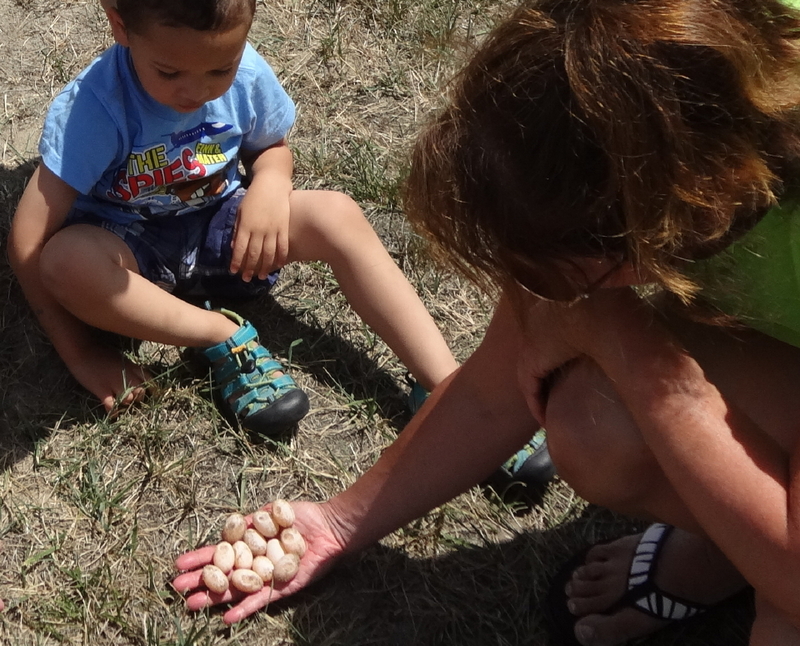 To ensure we can stretch a research triple into a home run, we relocated these viable eggs to a secure turtle garden and we capped the nest with a predator excluder. 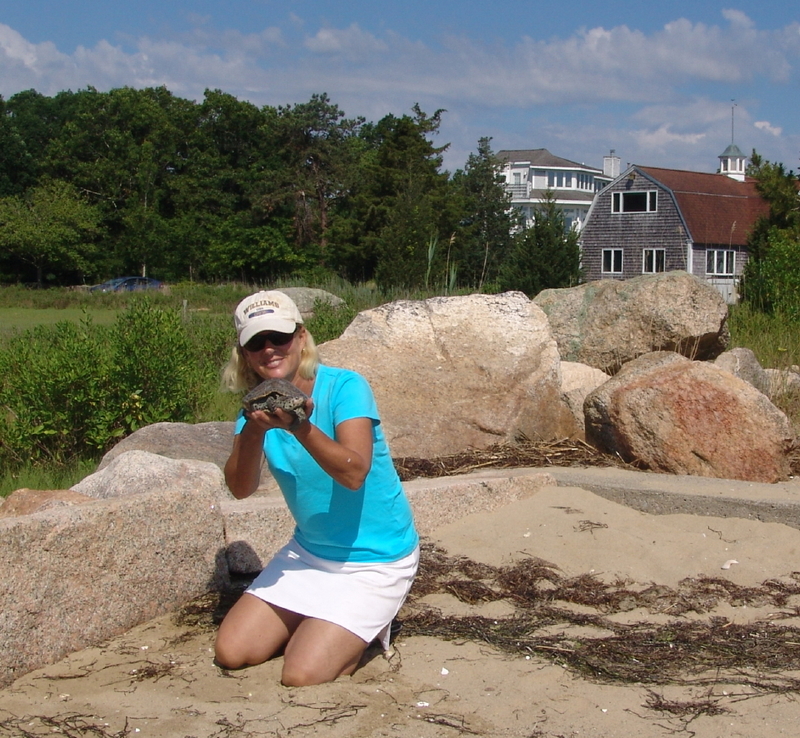 With a normal Cape Cod summer, we expect to see hatchlings emerge sometime around mid-September. As the time approaches, we hope Holly Beach residents will join Turtle Journal for a celebratory release party. Examination over; weights and measurements taken; and a job well and successfully done; Terrapin #272 left Holly Beach for Sippican’s Outer Habor. She raced to water’s edge and sped into the bay as though propelled by jets. So long, Terrapin #272; see you next year! Turtle Journal, our friends, our colleagues and you have been privileged to rescue thousands of turtles through the years in our shared mission to save the world one turtle at a time. We give these troubled critters a nudge towards survival, we hope for the best, and we never see them again. On special occasions, and particularly within our three decade long longitudinal study of terrapins, we get the chance to see the rescued specimen again, but usually long afterwards. Today, though, we saw a terrapin that was rescued and released into the wild only three weeks ago; and she told us … with her data, of course … how well she has adjusted to her new life. 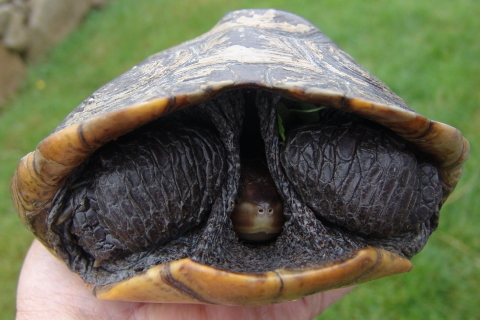 Someone had dumped female terrapin #325 (Bumpy) in a fresh water pond at Buttonwood Park in New Bedford. Where that someone had found her originally is unknown. From her skin markings, she appears to be a Buzzards Bay terrapin. But whether she had been scooped from an estuary or a beach in Westport or Dartmouth or Fairhaven or Mattapoisett or Marion or Wareham or elsewhere, we shall never know. What we do know is that staff from Mass Audubon’s Allens Pond Wildlife Sanctuary spotted her at the New Bedford pond on June 14th, realized she did not belong and called Turtle Journal for identification of her species and a course of action to rescue her. The first thing we did was to remove two large fresh water leeches that had embedded themselves into her right forelimb. Yes, Terrapin #325 has earned her nickname “Bumpy.” She has large and asymmetrical bumps along her vertebrals. She also has nine rather than the normal five vertebral scutes. 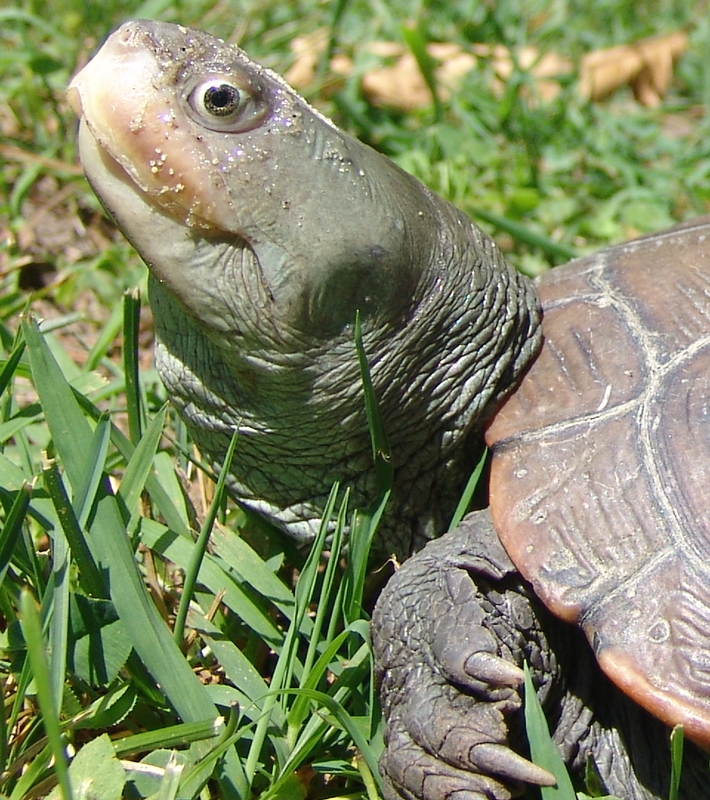 Clearly, this turtle has multiple stories to tell, some about her life history and others about her genetics. Yet, with leeches removed and given a few days to cleanse algae and slime she had accumulated in the fresh water, Terrapin #325 was ready to return to the wild; to real diamondback terrapin habitat, that is. Although we had no way to ascertain her home estuary, our research tells us that some Buzzards Bay terrapins swim extensively from estuary to estuary within the bay. So, the most important factor for us was to find a safe and convenient, terrapin-friendly estuary from whence Bumpy could make her own life choices. We released Terrapin #325 on June 17th. 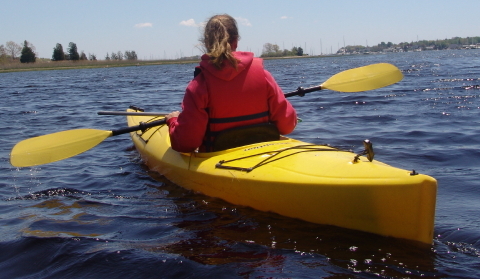 For her return to nature, we chose a protected, terrapin rich cove mid-way through Buzzards Bay. From there, she could easily chart her own course for the future. Little did we realize that we would encounter her again so soon … just three weeks later. And little did we appreciate how quickly she would re-adapt to her natural habitat. Sunday morning Turtle Journal received a call from Ed and Lisa at a terrapin nesting beach in the next estuary to the cove where Bumpy had been released. They had spotted a turtle and held it for us. Sure enough, it was Terrapin #325. Bumpy either swam a mile around the point or crawled a quarter mile across the peninsula to reach this nesting site. Her numbers tell the story. In a mere three weeks, Bumpy had grown 0.1 centimeter; she had gained 50 grams (nearly 5% of her body mass). And now she was quite pregnant, heavy with eggs and looking for a viable spot to deposit them. Not too shabby for three weeks of freedom! On shore to nest, female terrapins leave distinctive tracks in the soft sand. 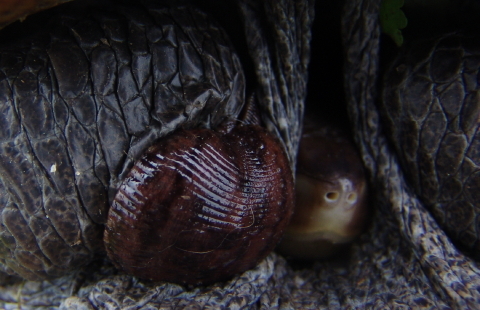 The plastron, her bottom shell, smooths the ground and often her tail carves a line down the center of this smoothness. Her powerful limbs leave “commas” in the sand bracketing the flat center. 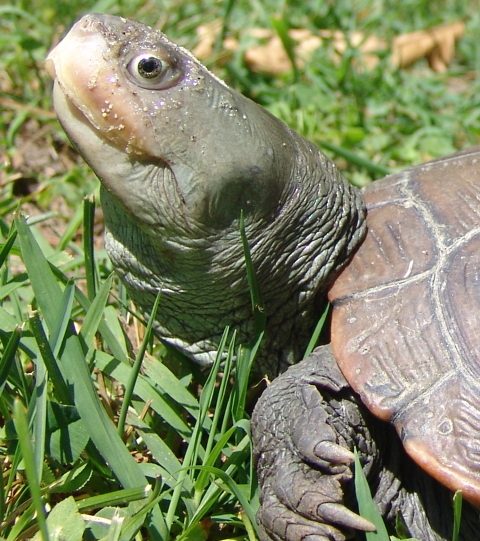 Seeing a turtle with tracks behind her helps to reinforce these lessons. In the field, it proves a little more challenging when you scour a well trodden beach for tracks that may, or may not, belong to the Buzzards Bay Bigfoot. On Thursday morning’s high tide, Turtle Journal identified terrapin tracks at a newly discovered nesting site in Sippican Harbor. The video above takes you along for the adventure. Will the trail end with only ephemeral footprints in the sand? Or will we successfully track down a legendary diamondback terrapin? 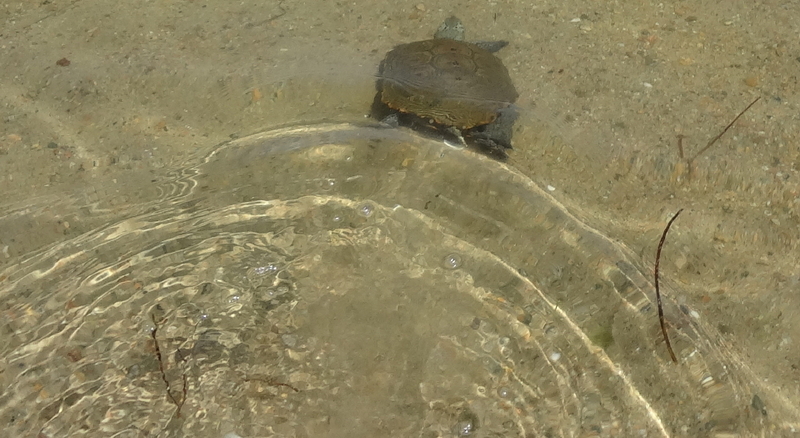 In this case, we not only discovered a rare diamondback terrapin, but this turtle gave us a research breakthrough. We have been capturing and marking terrapins in the Sippican Harbor mating aggregation for a decade. Yet, we had never found one of these turtles at a nesting site; not a single turtle. This one proved the first terrapin netted in the Head of Sippican Harbor to have been idenfitied at a nesting location. This female, Terrapin #265, was first captured at the Head of Harbor mating aggregation on May 30th, 2005 when she was a young lady of nine years of age. Back then she measured 18.7 centimeters shell length and weighed 1133 grams. Today, she has grown to 19.85 centimeters long and weighs 1344 grams. She also has the distinction of being the only diamondback terrapin that we have observed in Buzzards Bay (or Cape Cod Bay) with no spots, marks or patterns on her blue-gray skin. With leadership from an engaged community of citizen scientists abutting this newly discovered nesting site, Turtle Journal hopes we can make great strides to restore the dwindling terrapin population in Sippican Harbor. 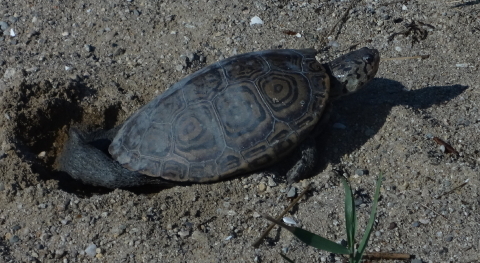 Turtle Journal’s Sue Wieber Nourse discovered a beautiful diamondback terrapin nesting on the beach at Tabor Academy’s Schaefer Lab off Sippican Harbor in Marion, Massachusetts on this morning’s high tide. A large female, she measured 8 1/2 inches long and weighed 3 pounds 2 ounces after laying a 5 ounce clutch of eggs. Wieber Nourse, as former director of the Schaefer Oceanonolgy Lab and inaugural holder of the Jaeger Chair for Marine Studies at Tabor Academy, had documented the presence of rare diamondback terrapins in Sippican Harbor with her advanced marine science students under a major grant from the National Fish & Wildlife Foundation. 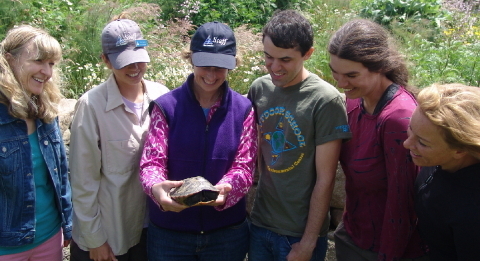 See the Boston Globe article of December 7th, 2003: Students Follow Clues to Rare Turtle. 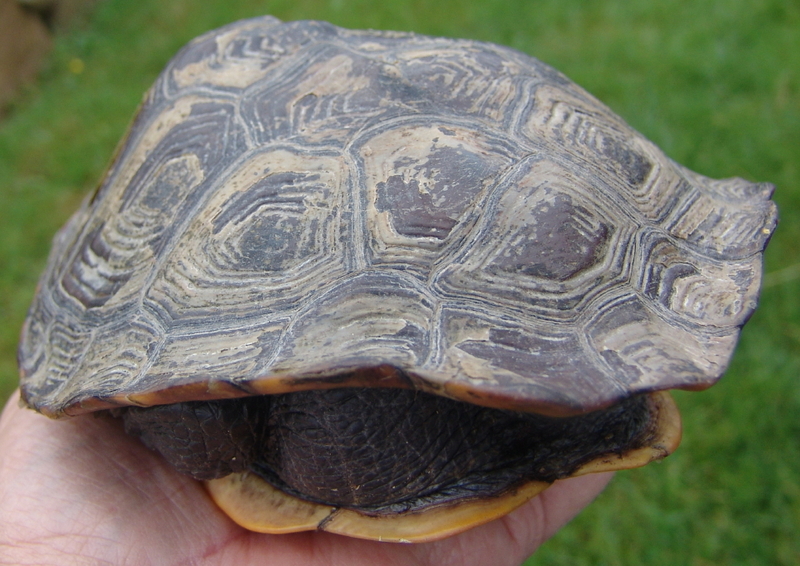 Also see the New Bedford Standard-Times report of September 17, 2004: Rare Terrapins Come Out of Their Shells. 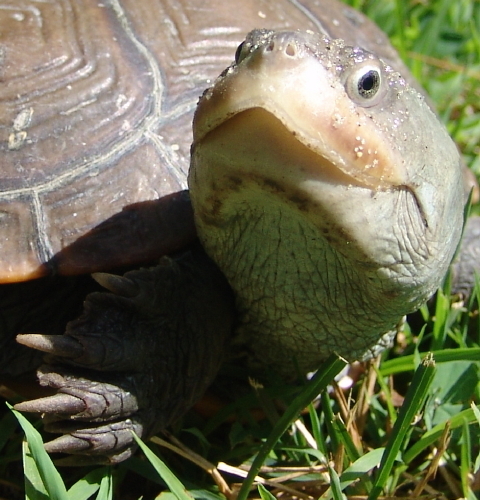 Diamondback terrapins are a protected species in Massachusetts where they are listed as threatened. 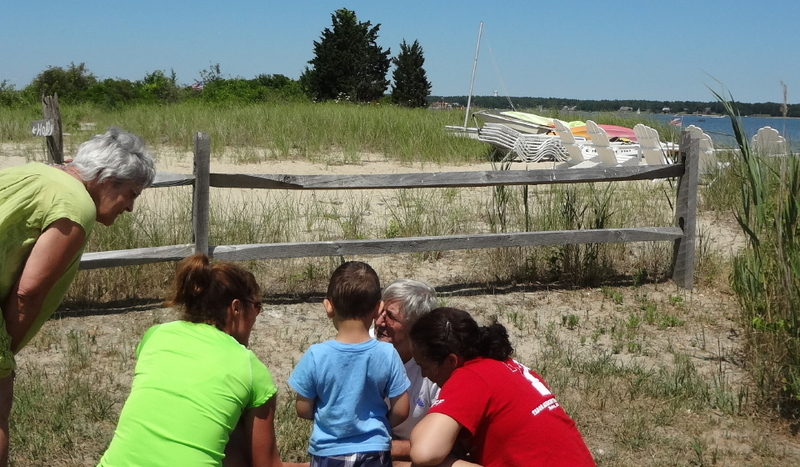 Their existence in Sippican Harbor had not been known before Wieber Nourse launched her hands-on, original research project at Tabor, a groundbreaking study at the secondary school level. Now, with Turtle Journal, she works to restore the at risk population of terrapins that she and her students found in Sippican Harbor. Coming ashore on the morning tide, this protected female first had to scale a concrete barrier installed at the beach edge (see top left). After climbing this obstacle, she had to zigzag among inflatable rafts, kayaks and canoes piled on formerly documented nesting sands. 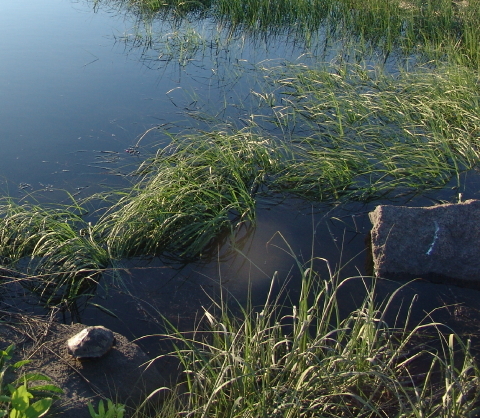 Beyond the watercraft maze, the female terrapin had to negotiate her path around a fire pit to locate a nesting spot within proximity of her natal site. When Sue came across this turtle, she was well into the nesting ritual, offering a great opportunity for Wieber Nourse to document the process for Turtle Journal. Once egg laying had finished and the terrapin had begun to cover, Sue was able to move in closer to record the unique way that turtles meticulously bury and disguise their nests. Without eyesight, they depend exclusively on their rear limbs that move with the delicacy of a Gheisha’s hands to emplace and then cover their eggs. This large female had deposited 12 perfect eggs in the nest, each weighing about half an ounce and measuring 1.5 inches long and almost an inch in diameter. Because of heavy activity at this beach during summer months, the eggs were harvested and relocated to a safe turtle garden to incubate. Once hatchlings emerge in September, they will be returned for release to the nursery salt marsh abutting Schaefer Lab. These babies will renew the cycle of life and restore the threatened terrapin population in Sippican Harbor that had been on the verge of extirpation before Wieber Nourse launched her successful research efforts. You are currently browsing the Turtle Journal blog archives for July, 2012.